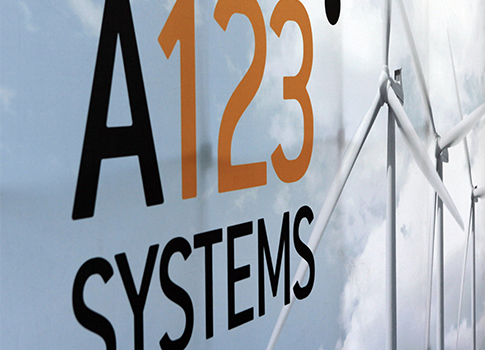 After bankruptcy, a buyout by a Chinese firm, and more than a hundred million dollars in taxpayer money, the lithium-ion battery maker A123 Systems, Inc., is getting a new name: B456 Systems, Inc.
A123, which produces batteries used in electric cars, has changed its name to B456, the company announced Thursday in a regulatory filing. The company filed for bankruptcy in October of last year and was later purchased by Chinese firm Wanxiang. The Department of Energy awarded A123 a $249 million grant in 2009, of which the battery maker had received $133 million when it filed for bankruptcy. The effects of the bankruptcy extended beyond the company. A123 was the battery provider for DOE-loan recipient Fisker Automotive, which ceased production last year. Fisker furloughed its U.S. workforce this week, the latest in a series of struggles for the company. This entry was posted in National Security and tagged A123, B456 Systems, Obama Economy. Bookmark the permalink.